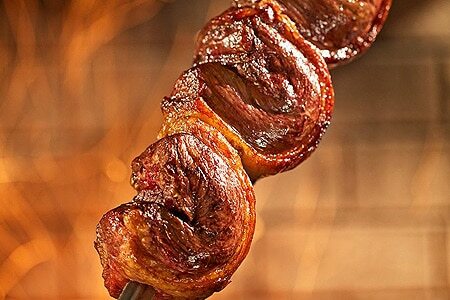 The first churrascaria restaurant in Texas and the first Fogo de Chão in the U.S.
: Lauded as the first churrascaria in Texas, this Brazilian steakhouse specializes in what it calls "continuous service"---that is, eating until you give up. Here's how it works: each person is given a disk, red on one side, green on the other. When you're ready to eat, turn the green side up and Brazilian-clad gauchos bearing long skewers of meat or poultry will make a beeline for your table. Be forewarned: You'll have about ten different choices, including everything from sausage and ribs to leg of lamb and filet mignon, all slow-roasted and nicely seasoned. For the same price, you can try them all or concentrate on just a few. Turn your disk to red when you need a break from the gluttony and back to green if you want to continue filling your belly. Also included in the price is a fully loaded salad bar and side dishes such as rice and beans, fried bananas and yucca. If you prefer a less interactive meal, try the costela---tender juicy beef ribs slowly cooked and presented on a plate; they're enough for one hearty appetite. This huge, quietly elegant restaurant also has a nice bar area and a secluded private room. Two words of advice on attire: elastic waistband.